This high-definition omni mic has been designed specifically to work in high-SPL environments, but it is surprisingly good on quieter sources too. Earthworks produce what they call High Definition Microphones, which are designed for accuracy rather than colour or character. They produce several ranges, many of which have a similar physical appearance (akin to a headless electric toothbrush!) to the TC20 under review here. 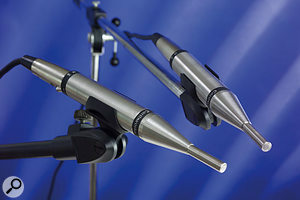 This microphone is one of their least expensive, and is designed for applications where the sound source is relatively loud, such as drums or brass. It is available singly or in matched pairs, and I receveived a pair for review, which came in a nice wooden case along with plastic stand-clips. Offering a fixed, omnidirectional pickup pattern, the TC20 is intended for both live and studio applications, but because it is designed specifically for high-level sound sources, it may be rather noisy to use when recording quieter instruments. In addition to the applications mentioned above, the TC20 is recommended for use under the strings of a standup bass and inside a kick drum, in place of the more conventional choice of kick-drum mic, and it is also well suited to miking guitar and bass speakers. The designer behind these mics is David Blackmer, an engineer well known in design circles as the inventor of the highly-specified Blackmer VCA, which is used in many dbx processors. David developed a number of new technologies for use in Earthworks microphones, which, in combination with the very small diaphragm, deliver improved transient handling, with less mechanical 'ringing' or settling time than conventional mics. This can only be achieved by building a capsule with a very wide frequency response that extends well beyond the human range of hearing: a typical Earthworks microphone operates up to 25kHz and beyond. A class-A balanced output stage, capable of driving long cables, completes the signal path. Mic design is a bit of a juggling act, because the smaller the diaphragm, the less audio energy you collect — and so the more gain you need to raise the signal up to a usable level. However, small diaphragms behave more like the theoretically perfect single pickup point than do large ones. They therefore have better-controlled polar patterns, and produce less acoustic shadowing of the sound being recorded. So there's a choice: you can have a small diaphragm with a beautifully-controlled polar pattern and a great transient response, but at the expense of some increase in background noise; or you can use a larger diaphragm to get lower background noise, but pay for this in accuracy. Accuracy isn't always a key factor (many large-diaphragm studio mics are chosen for their flattering characteristics rather than for their fidelity) but where it is vital, small diaphragms win every time. The usual compromise is to build a 'stick' mic with a capsule around half an inch in diameter, but Earthworks use a much smaller capsule and work hard on the electronics to minimise the noise. I mentioned that the TC20 is one of the least expensive Earthworks mics (it is their cheapest omni), but it isn't exactly 'budget'. The lower price has been achieved by designing the mic for high-SPL operation, which means that self-noise isn't such an issue — the 27dB SPL noise figure specified here would be unimpressive if applied to a general-purpose mic. Furthermore, the frequency response isn't quite so extended as with some other models, though it remains essentially flat from 10Hz to 20kHz, ±2dB. The maximum SPL handling of this mic is a massive 145dB, with a sensitivity of 8mV/Pa (that kick drum recommendation was no idle boast! ), but, because of the somewhat high noise figure, this isn't going to be the best choice for recording very quiet or distant instruments or ensembles. True to its claims, the TC20 is quite happy sitting over percussion, where it picks up a very detailed and articulate sound that feels more 'in focus' than what you get from most conventional mics. I tried it on a range of ethnic percussion, including djembe, dharbula and balafon, and it was the audio equivalent of wearing very clear reading glasses: it gave a good, crisp picture that really brought out the transients. Despite its highish noise floor, I also decided to use it to record a lute, to see just how well it could perform on quieter sources. I ended up with a mic distance of around 10 inches from the lute body and was rewarded with a recorded sound that was just slightly brighter than how I felt the lute sounded acoustically, with fantastic definition to the string plucks. I repeated the test using another favourite omni mic, which gave a sound that was tonally closer to what I heard in the room, but without the sense of super-focus that the TC20 gives you. On playback, the self-noise of the mic was only audible at playback levels that were louder than normal, during pauses where the instrument wasn't playing. Subjectively, I'd say it was less than I've heard with some Far Eastern mics that have claimed noise figures of 20dB or better. Having used Earthworks mics on a few occasions now, I can see why some engineers become really obsessed with them. Of course, a mic like this really excels as a drum overhead or percussion mic, but it is far more flexible than you might imagine, and it doesn't produce a clinical or unexciting sound just because it is accurate. I wouldn't buy a mic like this specifically for recording quiet acoustic instruments, but if you have one around, don't exclude it: you might just be pleasantly surprised. While there are numerous small-diaphragm mics that make a good job of recording the same kind of sounds, few other manufacturers take the small-diaphragm approach as seriously as Earthworks, other than in the area of measurement microphones. When it comes to fidelity, obvious rivals are DPA and Sennheiser's MKH-series microphones. Detailed sound that lives up to its high-resolution tag. High SPL handling, with excellent transient response. This particular model is a little on the noisy side of average. As a mic for loud sound sources that include a lot of transient detail the TC20 is really very hard to beat. £359 each; £795 matched pair.